The North Dakota state seal identifies government buildings and officials. The symbolism, history and emblems of the seal are described in this article with fast facts. Fact 2: Territorial Governor William Jayne approved the design on January 3, 1863. Although North Dakota became the 39th state, the seal has forty-two stars across the top. Since it was not known at the time of statehood as to which "number" North Dakota would be, it is assumed that the stars represent the 42 states which the Union encompassed by the end of 1889. 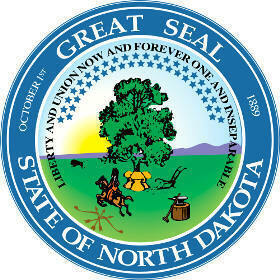 The North Dakota seal is kept and used as required by the Constitution and laws of the state. 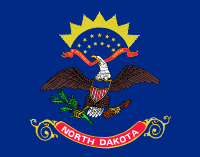 This is the 1889 design of the North Dakota seal which is very similar to the modern version. 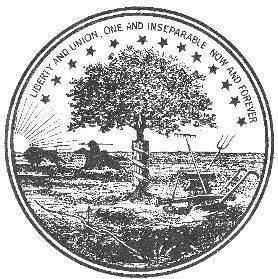 The pictures surrounding the seal represent the importance of agriculture to the early economy of the state especially in relation to the production of wheat and cattle ranching. Agriculture remains North Dakota's largest industry today.